Through the crack between the two seats, I watched the man in front of me. Not in a creepy way, but because there was simply nowhere else for me to place my head. We had barely begun to taxi, and the flight attendants had yet to give their safety demonstration, but the man was already scrolling through the options on his in-flight movie screen. He was a relatively burly man, with a shiny bald head. He sat in a middle seat on row 33 and had to be at least in his late 30s. He looked like a Chris. Upon further research, I can’t blame our friend Chris for his seemingly unfitting movie choice – Moana has a 96% on Rotten Tomatoes. So what’s the moral of the story? Don’t judge a book by it’s cover? Yes – but also, instead of watching Chris, I could have been taking a nap by then had I found a comfortable place for my head. There’s no better way to pass time on a plane than by sleeping. Some of us are blessed with the ability to fall asleep regardless of the environment, while others need everything to be just right. Make your nap more comfortable with a non-bulky travel pillow. Most travel pillows take up too much space. I’m only on a plane for a fractional amount of time, so why should I have to carry around a bulky pillow for the rest of the time I’m at my destination? Aeros Pillow Traveller solves that problem. It’s a normal, full sized travel pillow, yet deflates and fits in the palm of your hand. 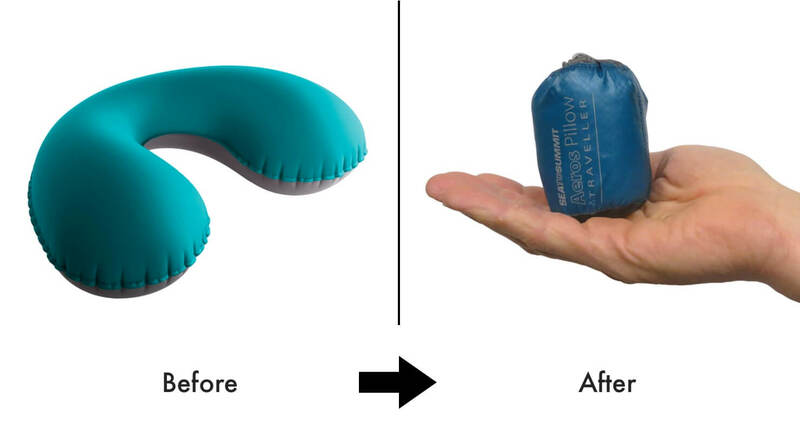 The Aeros Pillow Traveller can fit in the palm of your hand. Don’t like the ‘U’ shaped pillows? You can try the Aeros Pillow Premium, which inflatable yet is plush and soft – also perfect for camping. For the longer flights, a cozy blanket is always useful. Plane cabins are often cool, so blankets are perfect for warmth and some privacy. You might want to pass on the airline’s provided blanket, though. Apparently they don’t wash them. Blankets can be bulky, so to save extra space in your bag, one pro tip I’ve learned is to use a large travel towel, like the DryLite Towel, as a blanket. Another option is to use a sleeping bag liner, like the fleece lined Thermolite® Reactor Fleece Liner from Sea to Summit. A first class ticket on Emirates with an in-flight shower costs $18,000. 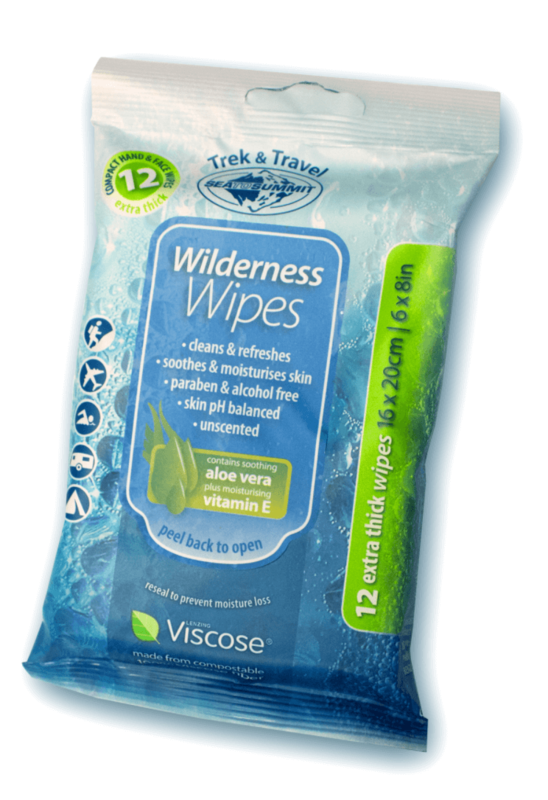 Sea to Summit Wilderness Wipes? $3.95. I get it. It’s not exactly the same, but it’s pretty darn close. 🙂 The perfect stand-in for a shower, Wilderness Wipes will “clean and refresh you when a shower, or even just water, isn’t a possibility”. These wipes will keep you fresh and odor free. They’re a must have for your next long-haul. You never know what’ll happen on a plane nowadays. 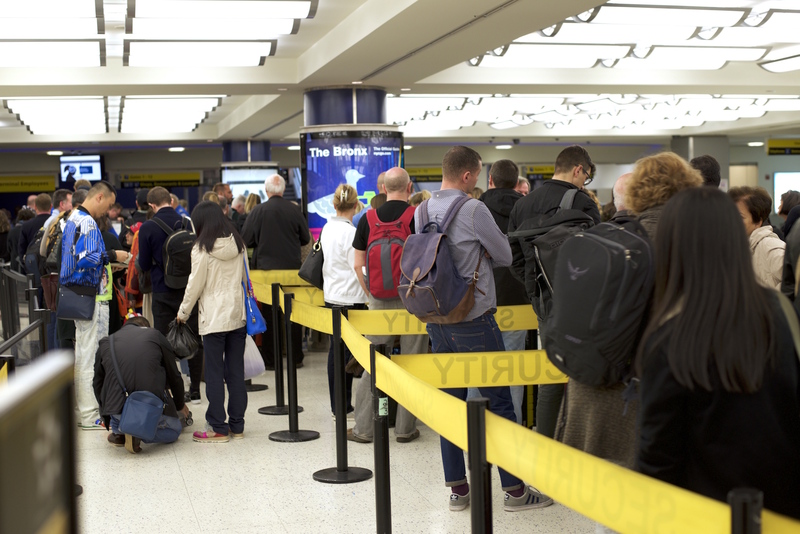 According to The Economist, the number of thefts on planes is rising. Unfortunately, it’s not always possible to keep an eye on your valuables. As a passenger, you’re often required to stow your bags away in overhead compartment rows away, out of sight. And more likely than not, during the flight you’ll be engrossed in a good movie (like Moana) or taking a nap (thanks to a comfy travel pillow). 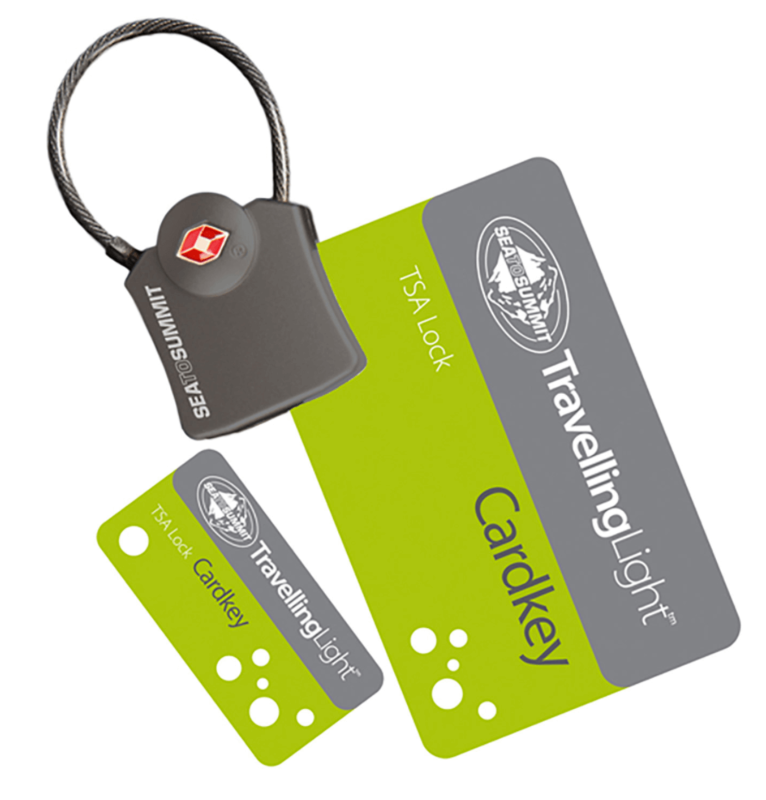 For some peace of mind, grab a TSA Travel Lock from the Travelling Light collection. Locks are proven to deter potential thieves and keep zippers from accidentally opening. If you don’t like remembering combinations, Sea to Summit makes a TSA approved lock which uses a ‘cardkey‘ to unlock. What are some things you do and use to make your flights more comfortable? Leave a comment below. This article was brought to you by Sea to Summit. Make your next flight more comfortable – check out Sea to Summit’s Travelling Light ™ collection.